Bartolome and North Seymour. Not far from Santiago lies the small island of Bartolome, and somewhat farther south, the island of North Seymour. Today we visited both. Bartolome resembles a moon-scape. It is a relatively new volcanic island and not much vegetation has taken hold, and consequently, it holds very little wildlife. After a dry landing we climbed a relatively steep boardwalk to the pinnacle, a trip of about 30 minutes. From the top we could overlook the entire island and Pinnacle Rock, an eroded “tuff” cone. Crystal clear waters offered great snorkeling for those who wished. We saw a few more Galapagos Penguins as we glided along the rocks in our Panga. Sea turtles and a white-tipped shark were spotted. In the afternoon we landed at North Seymour and walked. 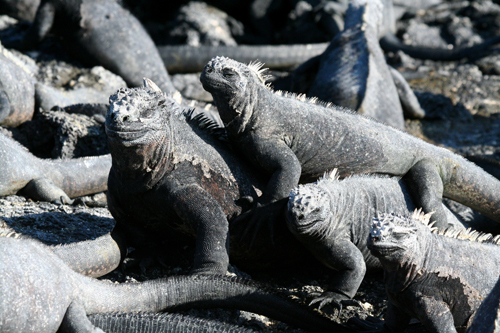 Among the sightings were Swallow-tailed Gulls, Blue-footed Boobies, and our first look at the endemic Land Iguanas. The island was full of Magnificent Frigatebirds, many in nesting mode, and many juveniles preening and exercising their wings. A few of the males were grandly displaying their red throat pouches. Santa Cruz. Over-night we cruised to Santa Cruz. 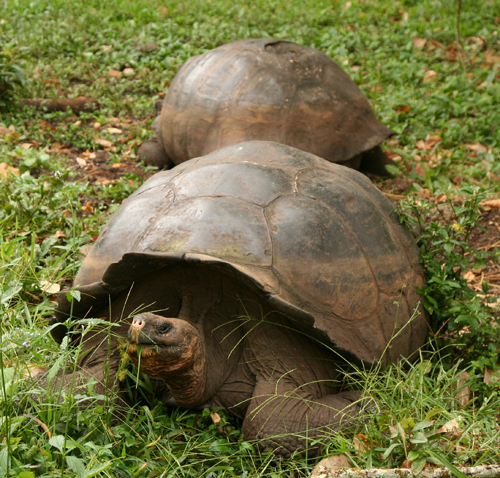 This morning we boarded a bus and traveled to the highlands of Santa Cruz, for our first look at free Giant Tortoises. This trip provided our first look at agriculture, with cattle again being the primary apparent product, accompanied by flocks of Cattle Egrets. We stopped briefly at an overlook in a forest preserve, where I saw my first Tree Finches, in this case, Small Tree Finches. We were surprised to see many Giant Tortoises freely roaming about the private ranch that was the focal point of the morning excursion. We were able to walk about freely among them for quite some time. We also enjoyed a walk in a “Lava Tube”. This is a large tunnel formed by the flow of melted lava (magma) from the ancient volcano which erupted upland from the tunnel. A Barn Owl was resting in a secluded nook near the entrance. 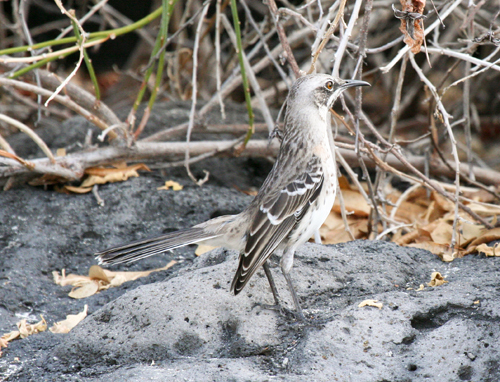 We also had brief glimpses of a couple of Galapagos (Dark-billed) Cuckoos. Galapagos Mockingbirds have been present in close proximity for several days. We returned to the boat for lunch and then went to the Charles Darwin Research Station at Puerto Ayora. 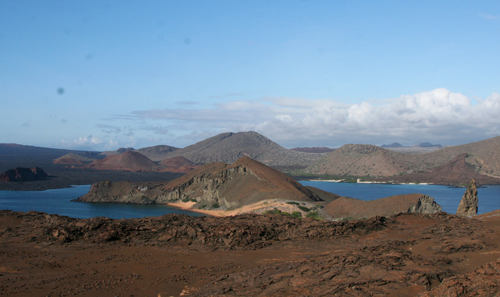 This is the largest town in the Galapagos, with a population of about 20,000 permanent residents. The Charles Darwin Research Station may well be doing important work, but as a tourist attraction, it did not offer much. 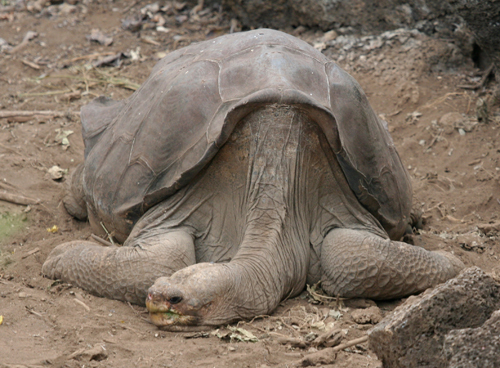 We did see “Lonesome George”, the last surviving member of the Pinta Island subscpecies of Giant Tortoise. So far, efforts to mate him with closely related subspecies have been unsuccessful, so Lonesome George may live out his life as the last survivor. We were told that the life expectancy of Giant Tortoises is not definitely known, but could be somewhere between 150 and 300 years. That latter part of the afternoon was spent walking around the town, which has a number of tourist shops. The ice cream was quite good. 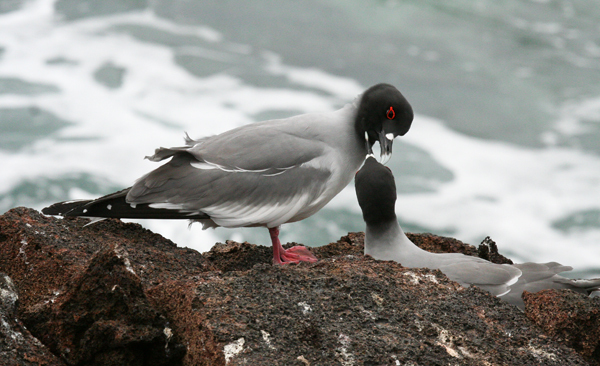 Lava Gulls were present in the town, along the water front. After dinner aboard, we made the long, and quite rough, crossing to Espanola. Epanola. Today, Saturday, November 5th, we arrived at Espanola and made a dry landing at Punta Suarez. This was our favorite place of the entire trip. We thoroughly enjoyed the long and leisurely walk along the rocky trails. 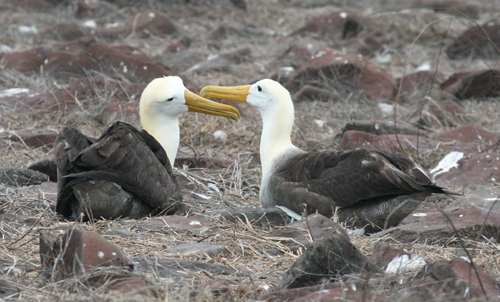 There was great variety, including a nesting colony of Waved Albatross. 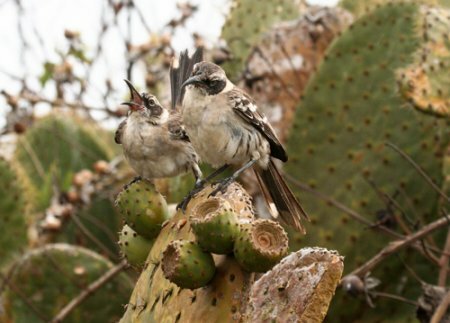 Frigatebirds, Swallow-tailed Gulls, Lava Herons, and, finally, a Large Cactus Finch. There were Red and Green Iguanas, lots of Sea Lions and innumerable Sally Lightfoot Crabs, strikingly orange on the black rocks. In the afternoon we made a wet landing at Gardner Bay, with its beautiful white sand beach. We ventured to wade in the ocean here, our first venture into the water, and found the water comfortably warm and very soothing. We shared the beach with hundreds of Sea Lions, who simply ignored us. Many Sea Turtles were cruising just a few feet off shore, poking their heads above water occasionally for a big breath. We again enjoyed an evening meal aboard, this time with Richard and Marie, one of the British couples on board. (The passengers represented 4 countries: 8 from the U.S., 8 from Great Britain, 3 from Germany and 1 from Canada). Return to San Christobal. From Espanola we cruised back to San Christobal. Our plane to Guayaquil did not leave until a little after noon, so we were able to visit the Interpretation Center at San Christobal. This is very worthwhile. After this visit we had a couple of hours to stroll around the town before boarding our bus to the airport. Endemic Species and Subspecies. 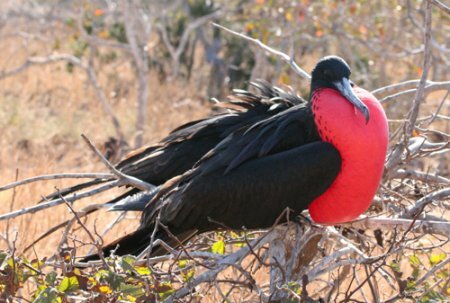 According to Swash and Still in their Identification Guide to the Galapagos, there are 44 endemic species and subspecies of birds (i.e., species or subspecies that are nowhere else in the world) that can be found in the Galapagos Islands. I was satisfied to be able to see and identify 33 of them, all mentioned in this and my prior blog. I did not see 8 of the endemic species: i.e., 5 of the Darwin’s Finches: Large Tree Finch, Medium Tree Finch (found only on Floreana, which we did not visit), Woodpecker Finch, Vegetarian Finch, and Mangrove Finch (very rare); Floreana Mockingbird (found only on Florean, which we did not visit); Galapagos Rail; and Galapagos Martin. and here and later in the afternoon on Isabella, Galapagos Penguins. 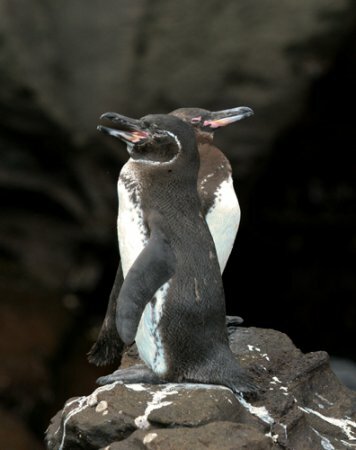 Galapagos Penguins are the most northerly distributed of all the penguin family. During our cruises this day and the previous day, I saw thousands of Elliot’s (White-vented) Storm-petrels, as well as a few Wedge-rumped Storm Petrels and Band-rumped (Madeiran) Storm-petrels. Red-necked Phalaropes silvered about the boat while we cruised. 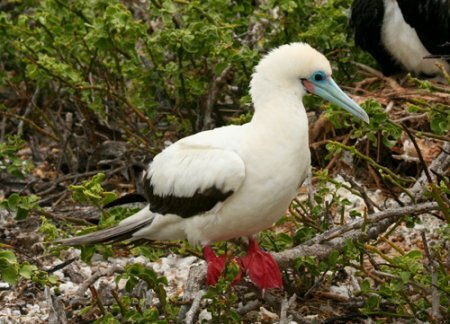 We also spied our first Blue-footed Boobies (Barbara’s favorite) of the trip. The first and only Pied-billed Grebe of the trip was here. No new finches today. Santiago (James). After breakfast we went ashore, a wet landing, at Puerto Egas. 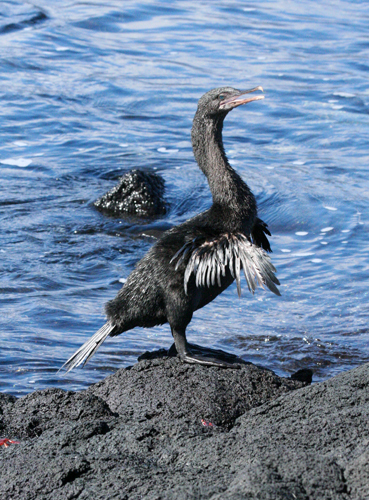 Birds were plentiful, as were the Sea Lions and Marine Iguanas. Here we saw the first Great Blue Herons and American Oystercatchers of the trip, along with several other migratory shore birds. 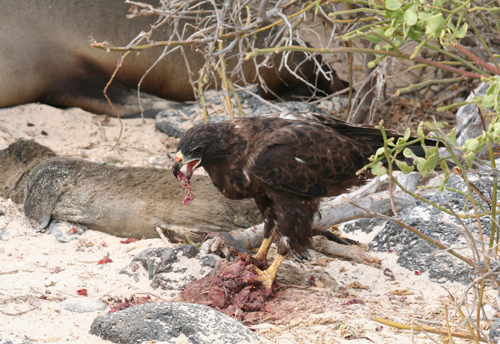 Here, also, we saw our first Galapagos Hawks. This female was busy tearing up the placenta of a newborn sea lion and seemed impervious to our presence just a few feet away. After lunch aboard we landed at Chinese Hat, a small island near Santiago. Again, Sea Lions were plentiful. Today we saw our first Smooth-billed Anis, an introduced species. 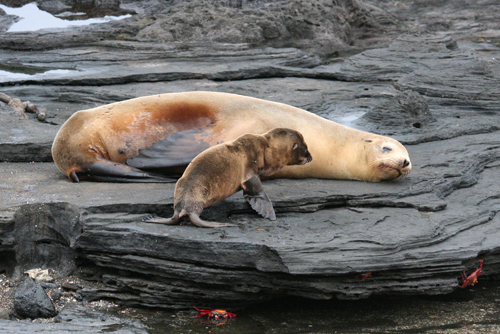 We wanted to go ashore on as many of the Galapagos Islands as we could during a 7-night cruise. After some (much) research on the internet, we chose to book directly with Ecoventura, which operates 3 identical 20 passenger yachts. They depart every Sunday afternoon from San Cristobal and return there on the following Sunday. Ecoventura arranged air flights for its guests on Aerogal to San Christobal, from either Quito or Guayaquil. They also made our hotel arrangements at the Mercure Alameda. All of these arrangements were handled efficiently so we had no concerns getting to and from all of our interim destinations. They also arranged for a bird guide and driver to pick us up and return us to the Hotel Alameda, with a full day of birding in the Quito vicinity prior to our cruise. See preceding Blog. The yacht itself was a superior first class vessel, clean and comfortable, with excellent food and services. I believe Ecoventura tries to group its guests so that there are common interests represented on the various yachts. The median age of our 18 co-passengers was 65, with only 2 “30 somethings”, both daughters of other passengers. None of the Eric passengers went Scuba Diving, but about half of us did enjoy several snorkeling adventures during the course of the trip. Those of us who chose not to snorkel, had ample other opportunities for interesting activities, primarily walks, during the snorkeling stops. I am a “serious” birder and I did my homework before the trip. It was well that I did, as I shall later explain. I highly recommend “Birds , Mammals, and Reptiles of the Galapagos Islands-An Identification Guide” by Andy Swash and Rob Still. It is very complete and among its various features it has a chart which shows which species may be found on which Islands. 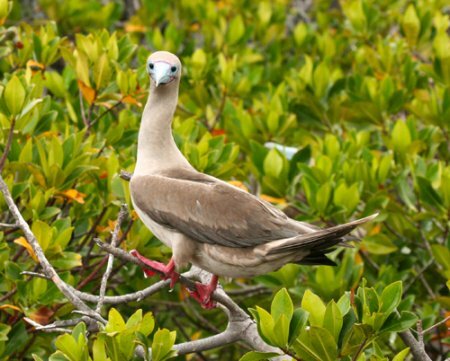 This proved especially valuable because the 2 naturalists on the yacht, though more or less competent, did not go out of their ways to help locate and identify the smaller birds, such as the 13 species of Finches. This, of course, is partly due to the fact that most of the guests are not serious birders, and probably would not have cared about such details, or at least would not want to spend a lot of time on them. We were met at the San Christobal Airport on Sunday, October 30. We were bussed directly to our yacht, the Eric. After the orientation, we selected wet suits, snorkel gear and flippers, even though we doubted that we would use them. They were destined to hang, unused, in our cabin for the entire trip. After lunch we had a wet landing on a San Christobal beach. A “wet landing” means you get wet up to your knees or so before you reach dry land when you get off the “panga” (one of two small rubber boats that take passengers from the yacht to shore). Some of the folks went snorkeling, some sat on the beach, and we, predictably, went birding on the edge of the short vegetation around the perimeter of the beach. 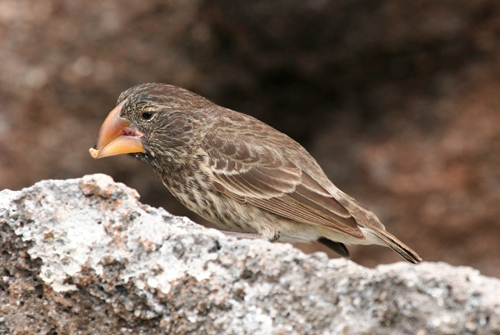 Small Ground Finches, Medium Ground Finches, Galapagos (Thick-billed) Flycatchers, and Yellow Warblers. Flying over the lagoon were numerous Frigatebirds (probably of the Magnificent species, although it was not possible there to tell them apart from the Greats, so I cannot be sure). We left San Christobal about 3:30 to set “sail” for the rather distant island of Genovesa. I patrolled the deck as we got started and was rewarded with a good look at a single Waved Albatross, not expected in this area. 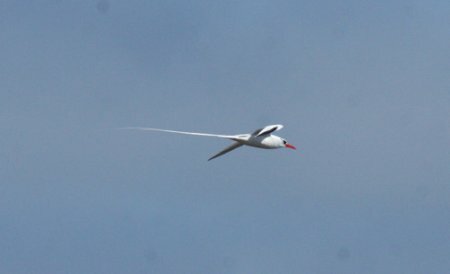 We also saw numerous Nazca Boobies, (formerly called Masked Boobies), Brown Pelicans, Galapagos Shearwaters (by the 1000s), and Common (Brown) Noddies. Around sunset we arrived at Kicker Rock with its vertical cone formation that juts up about 100 feet. We circumnavigated Kicker Rock for many nice views. 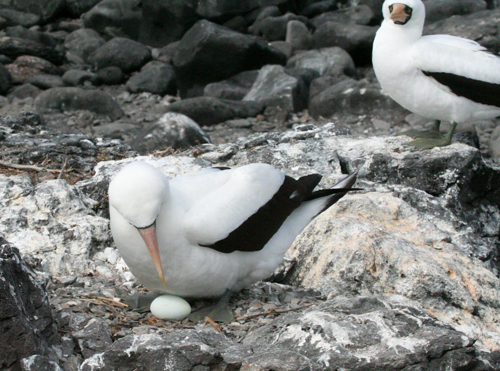 The Rock was densely populated by seabirds, all of the species (except Waved Albatross) just mentioned. We cruised all night to Genovesa. The trip was rougher than Barbara had expected, but, due to the “Patch”, she got through the night ok.
Sharp-beaked Ground Finches, and Warbler Finches, and Large Ground Finches. We started the long (14 hour) cruise from Genovesa to Fernandina before supper. 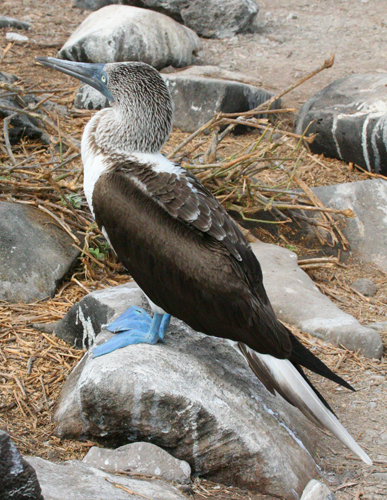 Fernandina is the youngest of the volacanically formed Galapagos Islands. Barbara’s “Patch” failed her so she spent a difficult night. 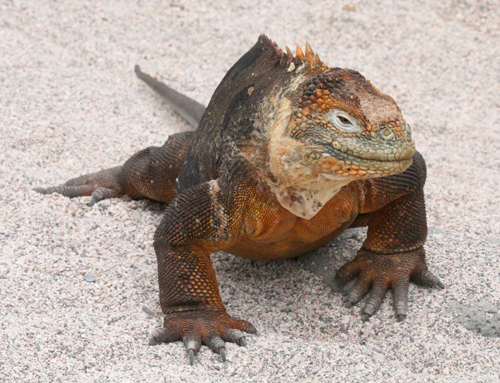 Barbara and I have considered going to the Galapagos Islands for several years, but we put it off until this fall. We decided to go now because in February, 2012 new rules will reduce by half the number of landings that cruise vessels can make on a 7-day cruise. 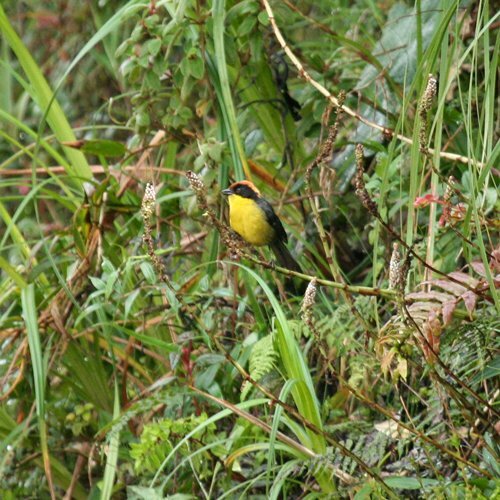 We decided to go a few days early to see Quito and to get in a day of birding in the Andes near Quito. We arrived in Quito on the evening of October 27th. We were met at the airport by a driver sent by our hotel, the Mercure Alameda. Our room at the hotel was clean and spacious, but extremely noisy all night. We endured it for 2 nights but finally had to ask to be moved to an interior room for our last night so that we could get some sleep. After a bit of difficulty at the desk, the manager found us an interior room and we were very grateful for the quietude that it gave us for our final night. Prospective guests of this hotel should be very sure to request an interior room if they hope to get a good night’s rest. On Friday the 28th we walked from our hotel to the Old City to see the historic buildings. Some have doubted our wisdom in walking in this area but it appeared to us to be quite safe, at least in daylight. We visited the Basilica. The interior is quite stark and the windows are beautiful. We then walked on to the Presidential Palace and the surrounding square. There were many people on the streets. Among the more interesting sights was the open-air flower market. The variety and colors were amazing. I cannot imagine how all of those flowers get sold, but it appeared that local customers were buying. We went on to the Plaza San Francisco and entered the ornately gold-decorated church, where mass was in process. We stayed for the mass. At the side of the church was a café with outdoor seating and we enjoyed a lunch including the local specialty soup: potato, goat cheese, avocado, and other unrecognized ingredients. From there and from other sites along our route we could see the statue of the winged Virgin of Quito high above the city. All things considered we were glad that we had spent the day walking around the Old Town. It was a very interesting day. At 5:30 the next morning we were picked up at the hotel by bird guide, Juan Carlos Crespo, and his driver. Juan Carlos works as a guide for Bella Vista Preserve, a remote natural area which is a long, rough drive from Quito if you go by the Nono Road, which we did, and a short, smooth, 2 hour drive if you take the main highway, which we did upon our return. 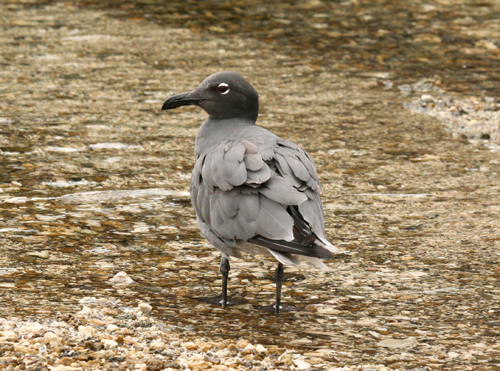 The Nono Road is famous among birders for its variety of birds. The first stop was at the Yanacocha Reserve. There we took a long walk along an easy mountain path. 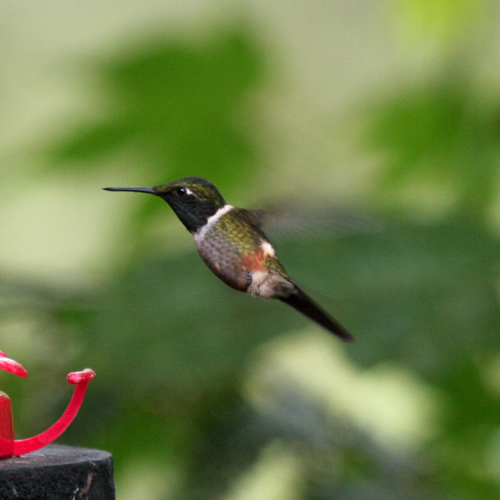 The most numerous families of birds in this area are the hummingbirds and the tanagers. 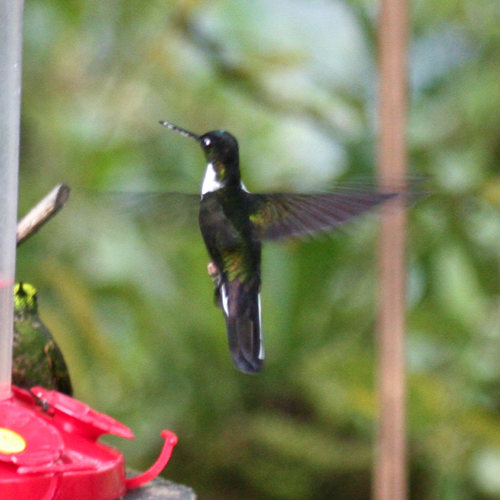 Sapphire-vented Puffleg, Golden-breasted Puffleg, and Tyrean Metal-tail. Along with the hummingbirds were quite numerous Masked Flower Piercers and Glossy Flower Piercers, which often compete with the hummingbirds at the hummingbird feeding stations along, and especially at the end of, the path. We were surprised and pleased when a Barred-winged Nightjar flushed from nearly under our feet. 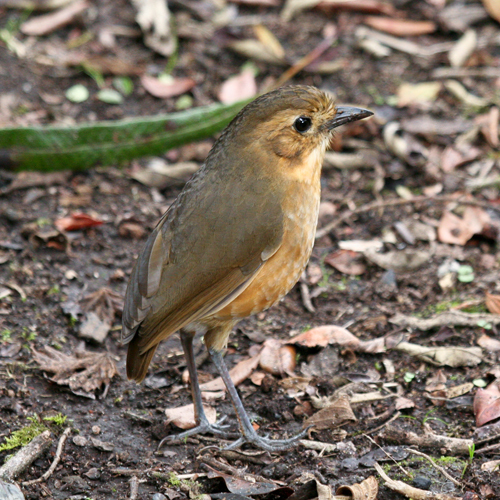 We were also able to watch a Tawny Antpitta at close range at the Ranger Station. The resident Ranger has been tempting it with tidbits of food and he was kind enough to spend some time with us to call the bird out of the brush so that we could get some close-up views. The other birds we saw at Yanacocha were: Andean Guan, White-banded Tyrannulet, Smoky Bush Tyrant, Great Thrush, Brown-bellied Swallows, Rufous Wrens, Spectacled Whitestarts, and Cinereous Conebill. 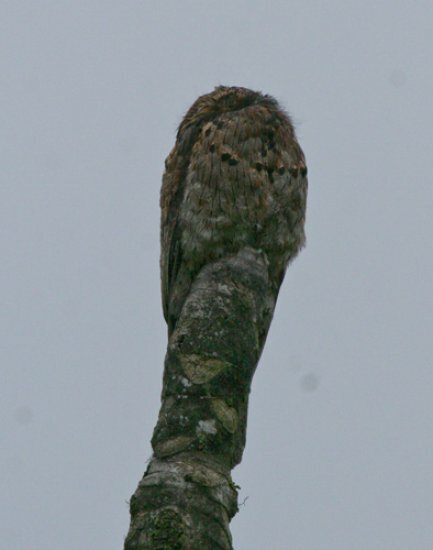 Birds not seen but recognized by their calls were Ocellated Tapaculos, Curve-billed Tinamous, and the Owl-imitating Giant Antpittas. We left Yanacocha after a couple of hours and proceeded on the Nono Road toward Bella Vista Preserve. Along the way we saw a pair of Andean Lapwings with a young chick. The country side is beautiful and rugged. Cattle farming seems to be the main livelihood of the few folks that live along the way. The Paramo was lovely in the morning mist and sunlight. 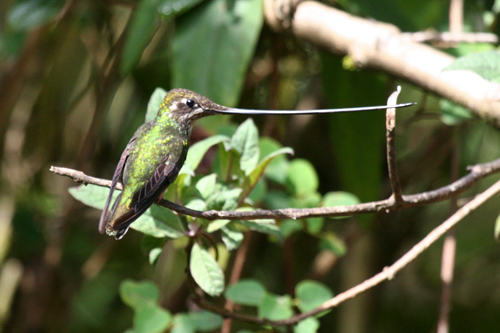 Buff-tailed Coronets, Gorgeted Sunangels, a striking Violet-tailed Sylph, and Purple-throated Woodstars. Crimson-mantled Woodpeckers, Montane Woodcreeper, Azara’s Spintetail, Streaked Tuftedcheek, Green and Black Fruiteater, Blue and White Swallows, Grey-breasted Wood Wren, Red-eyed Vireo (Yup!! The same as ours), Russet-crowned Warbler, Blue-winged Mountain Tanager, Rufous-collared Sparrow and more Masked Flowerpiercers. We enjoyed Juan Carlos’ company and were impressed with his knowledge of the Ecuadorean birds. 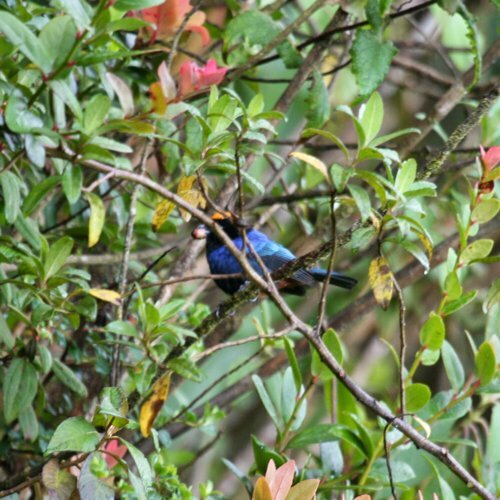 We would recommend him to others looking for a day or more of interesting birding in the Quito area. He is currently on the staff at Bella Vista. We arrived back at the Hotel about 6:00 p.m. and after a good night’s sleep, flew off to our main destination, the Galapagos, by way of Guayaquil. 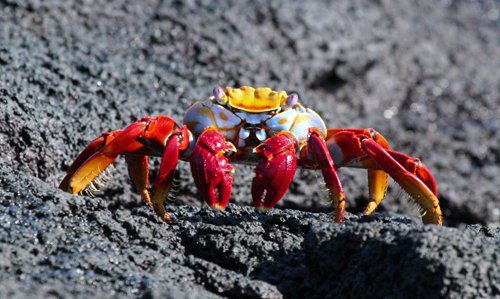 The next installments will summarize our experiences in the Galapagos.